Why Does Anybody Play Football Anymore? Football has never been more popular. And it has never felt less like a game. The exchange went viral during an NFL weekend defined by mangled bodies more than anything that could be called a game. 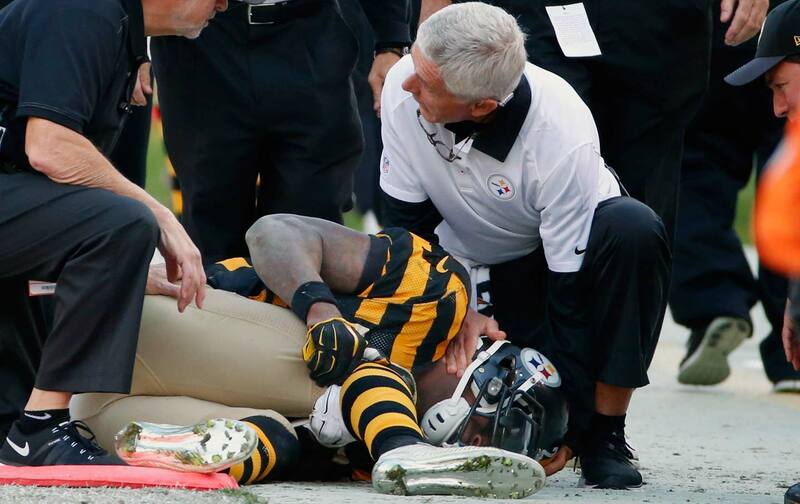 Running backs Reggie Bush and Le’Veon Bell are gone for the season with knee ligament injuries while receiver Steve Smith, Sr., playing in what was supposed to be his last season, had his Achilles torn, perhaps ending his career. It made one wonder: If this is what’s happening to muscles, ligaments, and tendons, what could be ripped and bruised inside a player’s skull on every hit? Unfortunately, a national television audience was given a gut-wrenching view of that very scenario. In a game between the Seattle Seahawks and the Dallas Cowboys, Seahawks receiver Ricardo Lockette—on a clean hit—was concussed, sustaining ligament damage in his neck, and will be out for the rest of the year. For his family, teammates, and the television audience, this diagnosis spurred waves of relief. This is because after he hit the turf, Lockette remained motionless as players from both sides held hands and prayed while the Dallas crowd was near silent. It was unnerving, and it spoke to the kind of existential fear in the pit of the stomach of every player and league-office bean counter: that someone could die directly from an on-field collision. The typical cause of death on the football field is sudden cardiac arrest, something which, in theory, could be screened for before any teenager takes the field. But in a country that for all its wealth has a crumbling public-school system, it’s hard to see how electrocardiogram machines could be available to every athletic department. In other words, you’re playing a lottery with kids’ lives. Are high schoolers risking their lives for a chance out of poverty or a sense of elevated status really “playing”? Given all we have learned in the last decade about the dangers of brain damage and chronic traumatic encephalopathy, why would anyone play? On one level it goes back to LeBron’s quote about why he won’t let his sons take the field, but that’s of course not the only reason. There are thousands of kids who involve themselves in football not because they dream of a way out of poverty (they know they’re not making the pros) but because they want other things that the sport brings—community, status, popularity, a sense of inclusion. This is certainly true of other sports as well, but there is nothing in this country that builds a cult of localized hero worship quite like football. And there is nothing as irrationally rational as teenage boys risking their own mental and physical health to feel special amidst the most awkward—and seemingly interminable—time of their lives. It brings to mind a famous quote that allegedly comes from a conversation between two generations of boxers. Buster Mathis Jr. and his father, Buster Mathis Sr. Buster Jr. was a young, massive, physically gifted teenager, and he asked his father if he should box or play football. His dad said, “Son, please play football. Because nobody plays boxing.” This story is usually told as a cautionary tale about the brutality of boxing compared to other sports. But now that quote needs a rewrite. Given what we know in 2015, the question is whether anybody is really “playing” football. Are high schoolers risking their lives for a chance out of poverty or a sense of elevated status really “playing”? Are those who take the field in the NCAA, exploited for billions of dollars in television revenue while working in a state of indentured servitude, “playing”? Are the NFL athletes who have to treat every single play as a potential threat to their brains, and get an average of three and a half years on the field, “playing”? The only people “playing” in this scenario are egomaniacal coaches and parents, craven NCAA thought leaders, and NFL executives, all preaching intensity and sacrifice, but really just playing with the lives of others. They are the sports equivalent of the Bush-era chickenhawks. Note how many big-time basketball coaches have kids who play hoops and note how few football coaches can say the same. Expect the LeBron mantra to grow in the years to come—no one will play this game if they don’t have to. And that “have to” exposes an ugly truth: No matter how many “mom’s clinics” the NFL runs, no matter how many safety protocols they initiate, no matter how many slick ad campaigns where they shout “we play football,” the pool of players will become smaller and less economically affluent in the years to come. We will then have to reckon with just what the hell it is we are watching every Sunday. Editor’s note: An earlier version of this article stated that LeBron James’s comments on his soon playing football were made this weekend. They were made a year ago. The text has been updated to reflect the correction and the quote has been expanded.